Self-adhesive Hinging Tissue by Lineco offers permanent hinging for translucent art. MHT1 is our L-Mount Hinging Tissue that measures 1" x 400" (35 ft.) and works well for thin, lightweight art, Japanese paper, and papyrus. 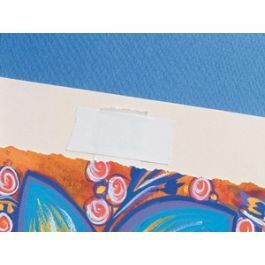 Press acrylic adhesive to the back of art or paper and watch this translucent, long-fibered tissue disappear. Neutral pH. Hinging delicate and translucent art requires special attention. 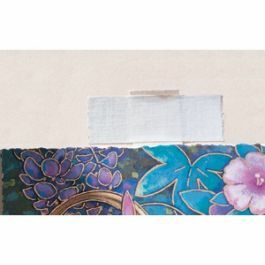 Our MHT1 L-Mount Hinging Tissue by Lineco offers archival quality for permanent mounting/hinging of Japanese paper, papyrus, and other lightweight art. This thin, long-fibered tissue is 1" by 400" (35 ft.) and is ideal for translucent art because it virtually disappears when applied. Tear tissue to the desired length for your hinging project. 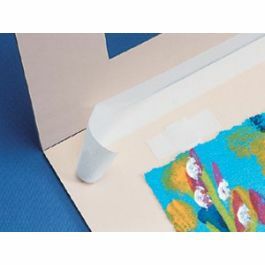 The acrylic adhesive is applied with light pressure to the back surface of art or paper. The material is pH neutral, non-yellowing, and acid-free. Mineral spirits are required to remove adhesive. The primary use of MHT1 is to hinge light or translucent art.